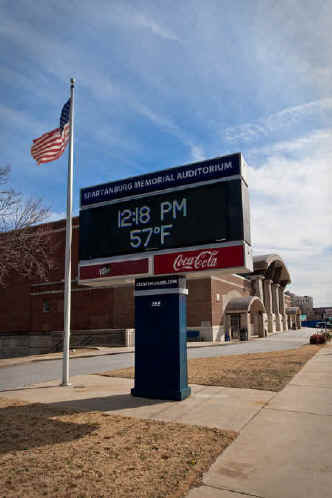 Would your company like its advertising message to be viewed on one of the largest outdoor full-color, double-sided electronic message systems in all of South Carolina? Mastar Signs in Greenville installed the sign. Over 250,000 guests per year visit the facility and around 19,000 people drive by the sign per day according to a meter survey done three years ago. The sign runs from 6:30 am to 11:00 pm per day. This can be modified. The ad can be changed on a weekly bases, it can also be programmed to run when you want it to run. For example during morning, lunch and afternoon drive times. A recent study by the S.C. Department of Transportation estimates that over 19,000 vehicles daily pass by the marquee. With an average of 2.5 people in each vehicle, that’s 47,500 daily commuters who will be seeing your ad! 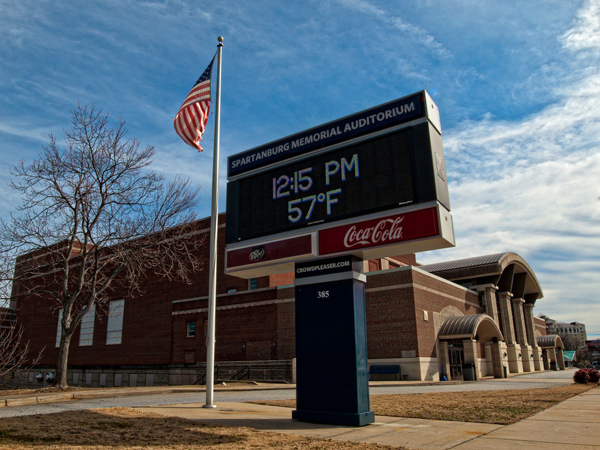 Advertisements will not be accepted that conflict with or compete against any events held at the Spartanburg Memorial Auditorium. Advertising messages must go through an approval process, and the Auditorium reserves the right to reject any advertisement. Messages considered offensive will not be accepted. If an advertising form is filled out incorrectly or a message includes too many characters, the Auditorium reserves the right to edit the message accordingly. 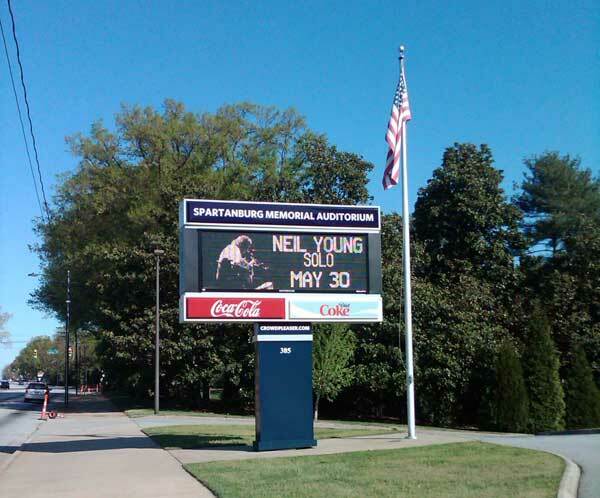 The Spartanburg Memorial Auditorium also reserves the right to reject advertising once the marquee schedule is considered full.